I'm a relatively new jewelry maker. I'm interested in so many facets of jewelry making that I'm going broke with tools. I enjoyed your tutorial on JumpRings. I've seen the Flex Shaft photos showing how wonderfully you can cut jump rings but I don't own a flex-shaft. Maybe I'll get one in the future, but for now, I'd really love a good tutorial on cutting thick coils like 14 ga into jump rings. I'm leaning toward a jewelry saw which I have but have not see anyone demonstrate CLOSE-UP, how to cut thick jump rings with one. i.e., Some say put the blade inside the spiral and the teeth facing in toward the saw frame and press down on the spiral]. Others say put the blade inside the spiral and the teeth facing out away from the saw frame and lay the spiral in a vise]. Others say cut the spiral from outside in, holding the jump rings tightly against a bench pin. What would you do to cut really thick gauge wire spirals, i.e., 12 ga or 14 ga.? I'm not making chainmaille clothing, but I'd like to be able to cut a spiral with a very clean cut that might be soldered closed later. Can you either tell me, or do a video or point me in the right direction? Thanks for your questions Carol! I use a jumpring cutting system when I want to cut large volumes of jumprings. But for cutting just a few or several dozen of them, I use my jeweler's hand saw. I believe that what you are referring to as a spiral is indeed a coil. First off, when you wind your coil, do so with a metal mandrel as the core. Wood mandrels are soft and the coils can bite into it giving you uneven jumprings and sometimes making pulling the coil off the mandrel impossible. It's easy to cut them as long as you use the correct size saw blade for the job. 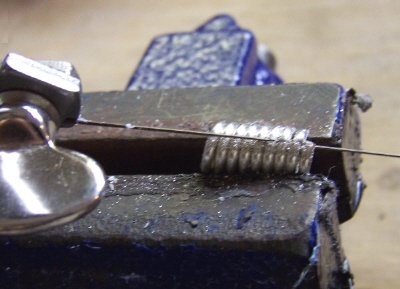 I usually use either a #2, #1 or size 0 when cutting jumprings of 16 gauge or 14 gauge wire. I secure the coil in a bench vise. Some vises have a notch inside the jaws which works really well for holding the coil. To prevent the coil from popping up while you're sawing it, try covering your vise with duck tape...that works well too and protects the soft metal from marring if the surface of your vise if it's not totally smooth. While normally the jewelers saw is held perpendicular to the material being cut, in order to cut jumprings you must hold the saw blade at an angle almost parallel to the coil. Otherwise you'll end up with lovely little half circles. :) Instead of sliding the coil onto my saw blade, I simply saw from the top or outside as shown in the photos. Be sure to lube the blade before you begin using either beeswax or even dry bar soap or other blade lubricant. Try keeping a container under your vise to catch any jumprings that fall. Usually after you've cut through your coil, the rings are around your blade. After loosening the vise, simply undo the saw blade to slide them off. You can shake them off, but they have a tendency to land where you'll never find them. If you find that your blade is getting stuck, loosen the vise a tiny bit. I agree with Stacy, her method works well, just remember to use bur/cut lube or bees wax to make cutting easier.